At least 32 PKK Kurdish militants have been killed in clashes in the Turkish city of Cizre since military operations began last week, according to Turkey’s interior minister. The ministry says most of the dead were Kurdish militants, but pro-Kurdish People’s Democratic Party, HDP, says 21 civilians were killed in the violence. Locals also say that the city’s under siege, and since the military has imposed a curfew they cannot even bury their dead. Now joining me to talk about all of this is Baris Karaagac. He’s a lecturer in international development studies at Trent University in Ontario. He’s also the editor of a book Accumulations, Crises, and Struggles: Capital and Labour in Contemporary Capitalism. Baris, thank you so much for joining us today. PERIES: Baris, let’s start with a little survey of the level of escalation of violence in the country we have seen in recent weeks. KARAAGAC: Well, we look at the past 40-50 days, we see a significant escalation in violence in the country. Following the elections in June, Erdogan and the AKP, the ruling party, that for the first time lost its majority in the past 13 years, effectively ended the ceasefire that had been in effect for the last two years with the PKK. And under the name of the war against terror, which was supposed to target both ISIS and the PKK, many operations were organized against the armed Kurdish guerrillas, the PKK. And at the same time, there were many operations not only in the countryside but also in urban settlements, in many cities and towns, in which the pro-Kurdish party, the HDP, got the majority of the votes. And one of them is a town on the border called Cizre. On the border with Syria, and also very close to Iraq. And this town has been under siege for about seven or [inaud.] the week. No one is allowed to enter the place. There are many military personnel, as well as the police in the town. We do not exactly know what is happening in there, but there are many unofficial reports. There are many witnesses who have been able to leak information. But we know that many civilians have lost their lives as a result of snipers shooting at them or as a result of artillery shootings. PERIES: So this is a situation where–Baris, this is a situation where the military is really trying to take out the militants, and that’s what is happening. But the snipers is a new thing, yes? KARAAGAC: At least according to some reports, that’s what we know. They’ve alleged that many civilians have been killed that way. And actually, one of them was from yesterday, because of [citing] artillery shots or some kind of bombing, a man was wounded and his daughter wanted to take him to hospital. So she leaves the house and she waves at the military people around that she wants to take him to hospital. But she was shot, and she’s dead. And many of the civilians who have been killed are women and children. Because funerals are not allowed, they are not even allowed to bury their dead. So there are some bodies that are preserved in freezers in this town. We can talk about all these kinds of terror. We can talk about–we can talk about state terror in this town of Cizre today. PERIES: Are there areas of the country where violence has also escalated? Give us a sense of that. KARAAGAC: Of course when these operations started against the PKK there was some reaction from the PKK. The PKK retaliated. And in the past week there were two major events after which [tens] of military personnel and police are dead. And this, one of them was in [inaud.] which is again on the border, and in [Ordu]. And these attacks by the PKK on the military and the police led to a very chauvinistic response by Turks in many cities. As a result the offices of the HDP, the pro-Kurdish party, have been attacked in more than 100 urban settlements. Even the headquarters of the party in Ankara was set on fire. This is the result of a very chauvinistic form of nationalism that has been actually provoked by Erdogan himself and his circle. PERIES: Now Baris, some people speculate that this escalation and the nationalist sentiment coming out of Erdogan are all leadup to the upcoming elections. Your thoughts on that? KARAAGAC: Well, I think behind all this escalation of violence is Erdogan’s desire to weaken the pro-Kurdish HDP. The political party that got 13 percent of the vote in June, and now has 80 members of the parliament. This was the biggest obstacle for Erdogan to effect constitutional change so that he could become a more powerful president. This is the main reason why he provoked this violence, why he ended the ceasefire, and why the Turkish military and the police forces are attacking the PKK. PERIES: Now, there is a protest going on by way of a march of MPs. Describe that and tell us what that is about. 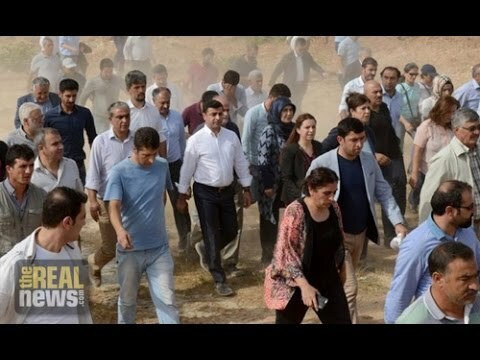 KARAAGAC: In order to protest and break the siege that has been in effect in Cizre, some of the leading members of the pro-Kurdish party HDP started a march. And thousands of people have joined them. And according to some reports, some of these people have been able to enter the city. They wanted to emphasize, they wanted to tell the world what was happening, or what is happening in this predominantly Kurdish town. PERIES: Baris, give us a sense of also the Turkish troops in the Northern Iraq border right now, fighting–apparently they have crossed the border to Iraq and they’re fighting the PKK. What is actually going on there? KARAAGAC: Last week the parliament passed a bill, and three of the four parties that are in parliament voted in favor of the bill, that authorized the military to operate outside of Turkey’s borders in Iraq and in Syria. The motive behind this is that there is–terrorism now constitutes a huge threat for Turkey. And now there have been a few attacks on the PKK bases in northern Iraq. But one of the questions that we need to ask, and maybe people need to ask, it was the AKP, it was the current president Tayyip Erdogan, who started the process that has been, that has come to be referred to as–that has come to be known as the peace or solution process with the Kurds. And for about two years the AKP was a major supporter of this process and was willing to negotiate with both the pro-Kurdish party in parliament and also the PKK, the armed wing of the armed Kurds that have been fighting a war against Turkey for about 30 years. What changed their minds? When we ask this question we see the reason why there’s been so much violence in the last two months. It’s because these people, the HDP, the pro-Kurdish party, did not allow Tayyip Erdogan, the current president, to change the system, bringing in a presidential system, and concentrate even more political power in his own hands. Erdogan is a leader that has shown dictatorial, very authoritarian tendencies in the last three or four years. So these were, the only people who were able to block Erdogan’s aspirations to become even more powerful in Turkey. PERIES: Baris, we’ll certainly be following this. And in our next interview we’d like to take up the issue of the refugee crisis in Turkey, and I hope you join us for that very soon. Baris Karaagac is a lecturer in International Development Studies at Trent University, in Ontario. He is also the editor of the book Accumulations, Crises and Struggles: Capital and Labour in Contemporary Capitalism.